As promised I am blogging the upcoming new class for 2009. I will mostly focus on January and a bit of February. Metal Smithing 101 with Suzanne Crudden begins January 14th and runs for 8 weeks on Wednesday nights. Cindy Vroom's Basic Bead Stitching 101 begins on January 22nd and runs for 4 weeks. This is a great introduction to different types of stitches. You can enroll in as many classes as you like, but you will get a discount if you enroll in all four weeks. And lastly, I know this class is not new, but we have only offered it once and cannot offer it on a regular basis. 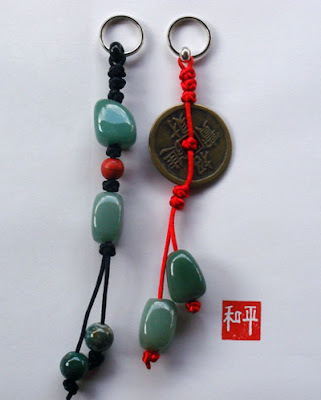 An introduction to Chinese Knotting with Angela Peace on February 14th from 2-6pm. Happy Beading all and see or "blog you" in 2009!! Happy New Year. Crimp pliers - oh sure - you can get by without them. You can crimp the crimp tubes that secure the beading wire by first flattening them with a pair of flat nose pliers, and then crushing a gap between the wires using your round nose pliers. But even the most tool-phobic person can see that is a clumsy way to go about it - that's what you do when you can't find your crimpers. The secret is that they have two holes - and you use the second one first. The second set of holes is shaped like a pair of lips, and you use these to flatten the crimp tube or round crimp bead - trapping and separating the wires through it, holding them securely. Then turn the crimped tube on it's side and use the first hole to fold it into a smaller, neater tube. Here is a 10-sec video clip to make that clearer. Don't cheap out on these. We have seen literally dozens of knock-offs of these - made in China - and no offense intended - whoever is making them has no freakin' idea what they are supposed to do. They just don't work. I've tried them all - I must have the world's largest collection of non-functional crimp pliers. But wait - there's more. You can use your crimp pliers for something else! That curved, outer hole in the jaws? Great for closing up crimp covers! Fabulous for tucking in that last little piece of wire in a wire wrap! Oh yeah, baby - they have more than one use! Alternately, you could spend your entire life only using the Tornado(tm) crimps - which you just crush with the flat pliers. But where's the fun in that? More tomorrow. Er - more NEXT YEAR!!! OK - so if you don't need 15 inches of solid stacked tools (see yesterday's post!) - what do you need? What is the minimum tool kit for someone making jewelry - stringing beads, making earrings, etc.! 2 pairs chain nose or small flat nose pliers - or 1 chain nose and 1 flat nose, or 1 chain nose and 1 bent nose. That's it. Pretty simple list, eh? I know the tool junkies will be disappointed, but really - you can do a huge amount with this - and nothing says you have to stop here. Carry on - buy more - but if you are getting started - this will give you a great foundation. You need to be able to cut wire, the beading cable, headpins, etc. These do the job. The are called "flush cutters" because they cut the item being cut to a flush, square end on one side - the other side is not flush. If you cut a piece of wire - you will see that of the two ends, one is flat, and the other is pointed. So, if you are cutting off the wire for a wrapped loop - you use the flat side, for a flat end - if you are cutting the stringing wire to string, cut with the un-flat side - to create a point for better stringing. Unfortunately - we aren't currently carrying these - as we were shipped a batch that we didn't like the quality of - and we rejected them. So -we are currently looking for a new source. But - they are readily available at hardware places, and electronics parts stores. Sometimes they refer to them as nippies, or nippers. Look for blades that meet all the way down, and don't cross when closed, or have a big gap at the tip. You really need to be able to cut at the tip. I have come to the realization that this project will take me a lot longer than a week. I am quite determined to see this finished though. The sheer amount of work involved is quite staggering! We have cleared through a LOT of junk. You can now actually see the floor! 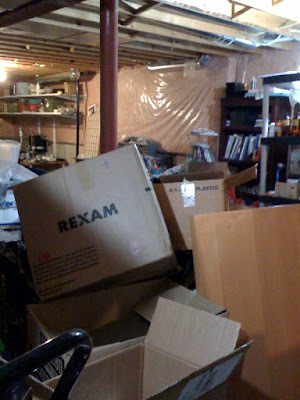 I can walk from one end of the basement to the other without climbing over empty boxes. 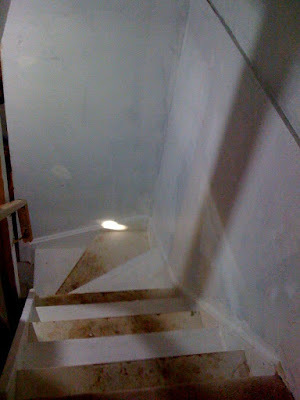 I've got on a coat of primer in some spots, and I''m hoping to get the rest of the primer up later today. I ran out of steam yesterday. I'm also heading to goodwill to see if I can find a nice big table. The plan is to get all storage under the stairs. Once I've got the wood painted, I'll hang up a curtain rod, and get some nice light fabric to hide the storage. I'm still trying to figure out what to do about lighting. I really need it a lot brighter down there than it is. I have to admit I was extremely proud of myself for resisting the temptation to get a fabulous chandelier for over the big table. I saw the perfect one while I was in Home Depot getting the paint. It would have killed my budget though. Chandelier or a sink...hmmm. Practicality won out for once :-) - maybe I'll get lucky and find one at goodwill that I can fix up. I'm still debating what to do with the walls. I really do want it brighter, but I don't think it's really practical to paint the plastic covering the insulation. If anyone has any ideas...let me know! Hi, My name is Dwyn, and I'm a tool junkie. It's been 3 days since I bought a tool. As you can see from this photo - I'm really over endowed in the plier-department! However - if you are just getting started, the number of tools you need is really quite minimal. If you have already bought a matched set - despair not. Use coloured tape, nail polish, or even a nice, durable acrylic paint to mark the handles so that you can readily ID them. One stripe for the flat nose, two for the round nose. Individualizing your tools also comes in handy when you take a class. I always schlep my own tools along to a class. The teacher may have lots, maybe not, but I always work better with my own. I'm used to the balance and the fit in my hand. It also makes them easier to get back from any other tool-crazed person you might have in your household. "But honey - those miniature pliers are great for fishing dropped nuts out of the carburetor." "Fine - I know what to get you for your birthday - now hand mine back or die!" Tomorrow: What is that list of minimum tools? The opening page of a website - if it does not contain a lot of content, but just a teaser or a short animation to get you more interested, is called a splash page. Bulgari takes this literally - with a delightful and delicious little video of truly beautiful jewelry being splashed through water. Worth watching twice, actually. But then you get into the site - and oh my! Lots of content! And the jewelry! Oh my! Be sure to check out "Magnificent Jewels" - both "Bulgari Creations" and "Photographic Artwork." If that doesn't get you thinking differently about fruit - I don't know what will. The goal is to get rid if the years of accumulated junk, organize, brighten it up, and install a sink. What we're working with is an unfinished basement, lots of already available storage options, and about $700 in Christmas money/gift cards. With that, I'll need to buy a sink, paint, and lighting...hmmm, sounds a little optimistic. 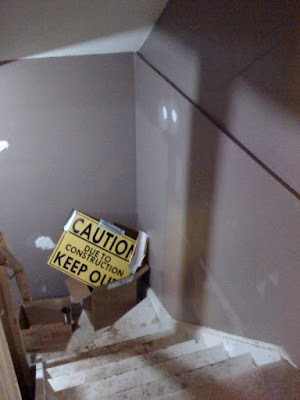 The basement, when done will have a couple of clearly defined areas. 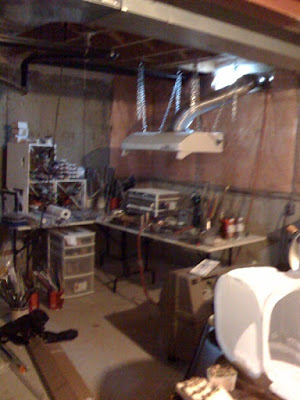 One is my lampwork studio - although due to carpal tunnel I haven't been able to make beads, I still have hope. The second area is for my beads, and jewellery - need to be able to have my foredom, and other tools set up - plus plenty of work space. 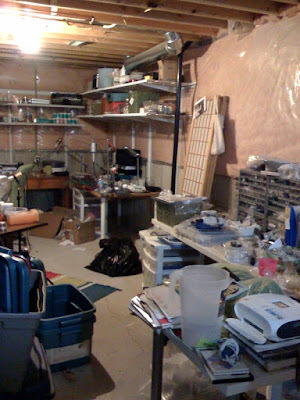 The 3rd area is for my mother and I, for our soap crafts and storage. And finally, I need a big table that can be used for assorted other crafts, or anytime I need to spread out. Also, I'd like this space to be a bright, cozy spot that I can do crafts with my daughters. 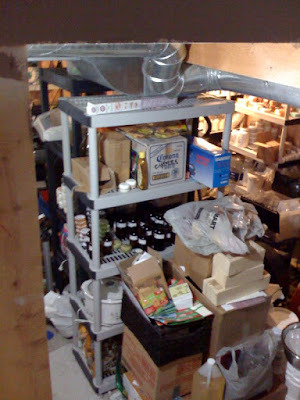 Fortunately, we already have a lot of tables, and shelving that can be put to better use. Today is mainly organization. We'll be doing the odd dump run, and a couple drop offs to charities. Whatever can be salvaged to be given away will go to charity boxes. I can't believe I'm about to post the photos below. 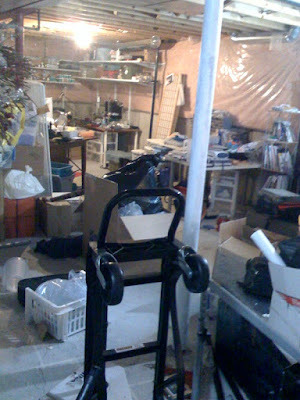 Wow....my basement is a complete disaster zone. 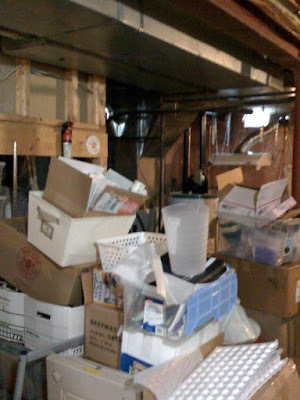 I'm pretty embarrased about this, but I'm sure I'm not quite the only one who's basement looks like this. And hey, If this encourages anyone else to take control of their space - then it's worth it! Last week - Jen promised to show you some variations on a bracelet that she made for the Inspirations. But then, she had some technical difficulties. Jen finally managed to locate the bracelets - but not the photos - so she sent them with me for shooting. Here they are. The original bracelet is in the centre - and the colour variation is on the left is the second one. This is a pleasing combo of dark blue, light blue and light mauve. The third variation, however, proved to be quite interesting. Instead of the 6 and 8 mm pearls - this is made with 4 and 6 mm pearls - and it changes the look and feel quite a bit. The bracelet is a little more restrained, and, in Jen's words - and I can do no better - "less bobbly." The smaller beads also expose more of the underlying crystal beads - giving this a little more glitter. Try this as pretty variation of Mixed Metals. The construction is the same - the only difference is the step-down in size in the pearls. I would like to second what Dwyn posted yesterday. I hope everyone had a fabulous holiday/turkey day. I'm still stuffed, and am buried under a mountain of kids toys. Today, we're doing more visiting, and of course the organizing begins. - Where do we now put this new toy mountain? Must get it out of my living room! I do a lot of crafts, and so do the girls. Our house has bits of craft supplies everywhere. He has promised to help finish setting up my studio in the basement. 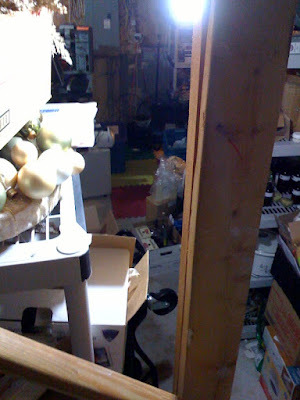 Over the holidays, we're going to clear out all of the junk, and set up the basement so that the girls and I can actually work down there. We started this last year, but life got in the way - it never got done. I can't wait! It will be lovely to have everything in one spot. On another note, we are posting new inspirations daily over the holidays. Be sure to have a peek! Hope you are having a wonderful day - playing with your new toys, visiting with family and friends, re-visiting your childhood, and anticipating a wonderful meal! May all your Christmases be merry and bright. and some returning. This week I will talk about the returning classes and next week about new classes. 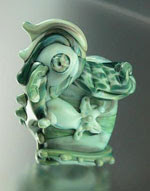 First off for all the avid lampworkers, Dwyn has just booked the Lampworking 201 class. It begins February 5th and runs for 8 weeks. This is an intermediate class and should be tons of fun. Heather and Jennifer also have an Intermediate Intensive Weekend coming February 21st and 22nd. Robert Burton has another Wire Wrapping 101 class coming up on January 25th and it runs for 3 weeks. There are only a few spots left so if you are interested you should call and book right away. Catherine Winter has two classes this month as well, so if you're News' Year Resolution was turn you beading addiction into a business her classes will help you out--A LOT. This is a real treat. Catherine is not usually here in January, so we have been lucky enough to get some extra class time with her. I hope that everyone has a Merry Christmas, Happy Hannukah, Happy Kwanzaa or a great couple of days off!! hehhehe....look what we found on our floor! 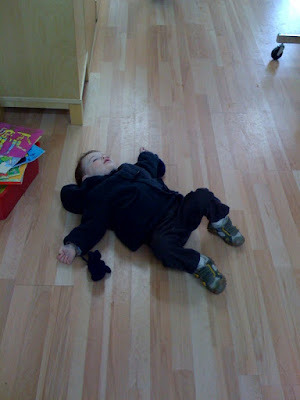 The little one decided he'd had enough of all of this shopping. Ever sit down in front of your beads, and suddenly discover you feel, well, uninspired? Been there, done that. Strung that, beaded those. Bla, bla, bla. If not, well - good for you! But sometimes, especially if there is pressure to make something - like a pearl necklace for an aunt, and you really don't like pearls, or maybe something to take to a gift exchange, or heaven forbid - you're writing an article!!!! - Sometimes, the inspiration doesn't flow. Two schools of thought. One is the step back approach. Get some distance - go for a walk, get some air, read a book, make a sandwich, watch a little t.v., etc. Come back a couple of hours later, and feel refreshed and ready to begin anew, perhaps even inspired by something you saw during your break? Oooh, pink ham and green lettuce colours would make a great bracelet! The other is the "work-through-it" approach. Sit there and make something - don't worry about how bad it looks. Grab a spool of beading wire and start stringing stuff. Pull out beads and start putting them on. Keep going. Put two or three beads together. Try stuff that you think won't go. Oh, that looks bad, let's try something else. Hey, that's not too bad, what if ... ? That would look great, but I'd need 50 more of them, what else can I try? Try both tactics- see what works for you. It may be that you don't have time to go for a walk - so try the "work-through-it" approach sometime. You might be completely surprised at what you create! Now, here's a website that I would normally hate - it does things that I consider to be poor design. For instance - it expands the browser window to full width - I hate it when web designers want to control my computer, and it really is little more than an electronic version of a paper catalogue. Complete down to the page turning interface. But oh, the jewelry! The Jewelry! It is so beautiful - all is forgiven! The "High" jewelry collection - and the piece "Torchon" - like a massive, twisted rope of gold! And the watches! And the silversmith work! The Jam Jars! Are they not wonderful? Never mind what I said about the web design - the site is beautiful! Next week - due to Christmas Eve falling on a Wednesday - we'll do the update on the Tuesday night instead. And boy - do we have some beautiful stuff for you! We have some daggers - with SPOTS! And a new shape of firepolish - the Faceted Bicone Rondelle Rivoli - ok, that's more of a description than a name - but they are very sparkly! Other stuff too, so keep an eye open on Tuesday night! Kate McKinnon arrives at Beadfx!! As many of you may have already heard, Kate McKinnon is returning to Beadfx in May of 2009! We are very excited to have her back and are anticipating a great week of classes. We are currently updating our systems and therefore cannot post the classes on the site yet. All of the details will appear on the site as soon as I can get them on there. That being said, I will post some details here and if you are interested you can book now by calling the store. $250.00 class fee and approximately $100.00 kit fee. Please note that kit fees are approximate and will be finalized closer to the class dates. For pictures and more detailed descriptions visit Kate's website at www.KateMcKinnon.com click on her journal and on the Toronto section and all of the details and pictures are posted there. If you are looking for something a little sooner, we still have lots going on in the New Year. Catherine Winter also has 2 classes this month How to Price your Jewelry-Starting a Microbusiness on January 15th and How to Have a Successful Craft Show on January 24th. Learn to Make Glass Beads with Amy Waldman-Smith on January 23rd and 24th. On Sunday during our demo day, I had designed a new colour combination for the mixed metals bracelet. It's a lovely blue/purple mix. This took about 4 hours to complete ( I was chatting a lot). One of our customers who came in to watch the demo, decided to make a smaller version for herself. The project is identical, but instead of 6, and 8mm beads...You use 4, and 6mm beads. I actually like this version better in a way. The first version is fun and BIG. The second version is more wearable for day to day. I used a combination of silver, and beiges for glittery, but very elegant look. For those of you who missed the original, it can be viewed here. You will need to pre wrap about 150 pearls no matter which version you do. 150 will give you a pretty big bracelet. I had about 6 or 7 of each pearl left over. How many you need will depend on your wrist size. Keep repeating! The pearls, because they are prewired into wrapped loops, will bunch together and give you a small little bauble of pearls. The crystal provides just that hint of sparkle beneath the pearls. I would love to see your other renditions. This was a particularly popular inspiration, and can easily be adapted into a million other versions using different types of beads. If you've made one, we'd love to see it! I'll be back later with an update on my latest inspiration, and some new versions! A friend introduced me to a source for well-made, hand-crafted paper bags - perfect for low-enviro-impact gift-packaging and packaging your hand-made jewelry. 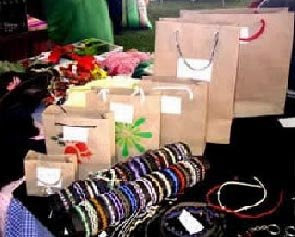 The bags are hand-made from a paper with a distinctly handmade feel - it is heavy, yet soft and pliable - not at all like grocery bags - and has a tied, handmade rope hand handle. They are a natural, unbleached colour, and just scream out to be personalized with stamps and ink and what-have-you. They come in a variety of sizes, perfect for whatever you are packaging. 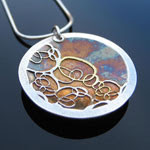 Feast your eyes on this jeweler's site - beautiful jewelry - stunningly presented. Seed Bead City - close to 50 new seedbeads - most the loverly size 11/0 Toho's - for precision, consistency and wide colour range! As we head into the holidays, things start to settle down a little here. We seem to be the opposite of most retailers. We have two busy seasons, one starting in February/March, as all of you jewelry designers start hustling to get your designs made up for your Spring/Summer shows. Then, we're busy again starting in September, as you all start working on your holiday/Fall shows. While we have a little more time on our hands, we start planning out the classes for the new year. We're always on the lookout for fresh talent, and new and unique classes. If you have something you think might be a good fit for our store - Send an email to cynthia@beadfx.com. We'll then arrange to meet to discuss all of the details, and see if we think your project will be a good fit. I know we have tons of super talented customers. Let's see your stuff, and it's a great way to make some extra money! 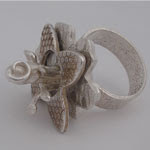 Sunday December 14th from 12-4pm is Demo Day here at Beadfx!! Come by and watch free demo's all afternoon. Jennifer will be demoing her Mixed Metals Bracelet. Rosemary will be doing some chainmailling. There will be earring demo's and some basic techniques as well as much much more. Come and have a look!!! Our new year's class schedule is beginning to fill up and here is a preview of a couple of our new classes. Metal Smithing 101 with Suzanne Crudden is finally here! Starting January 14th and running for 8 weeks we will be offering the introduction to Metal Smithing course once again at Beadfx. I know that many of you have been emailing me and asking for details and they are posted on the site. Call us if you are interested, there are only 8 spots so don't wait!! 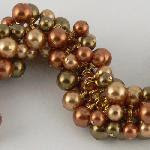 Also new is a techniques based course with Cindy Vroom, Bead Stitching 101. This class will run for 4 weeks beginning Thursday January 22nd from 6:30 to 8:30. This is not a project based class, it is technique based. The focus will be on learning stitches not on making any particular project. You can enroll in just one week or in all four. This class will focus on Peyote, Netting, Right Angle Weave, and Herringbone stitch. If you have been struggling with any of these or have always wanted to start stitching but have been unsure where to begin this is the course for you! 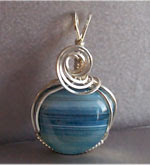 Robert Burton's Wire Wrapping 101 class begins Sunday January 4th from 1-4pm. Suzanne McNely is back in January too. She is offering her Photopolymer Plate Workshop on Saturday January 31st from 10-5pm. Don't forget about some of our great December classes as well. Catherine Winter also has two classes this month. Happy Beading all and hope to see you at Demo Day on Sunday!! Sometimes - it's not what you see that counts. Can you believe it is nearly 2009?